After a lengthy break from writing about liner notes written on the back covers of random old LPs, our Lost Art of Liner Notes series returns as I make my way through a bounty of ten cent records I acquired on a recent record shopping expedition. Can’t sleep … clown will eat me. 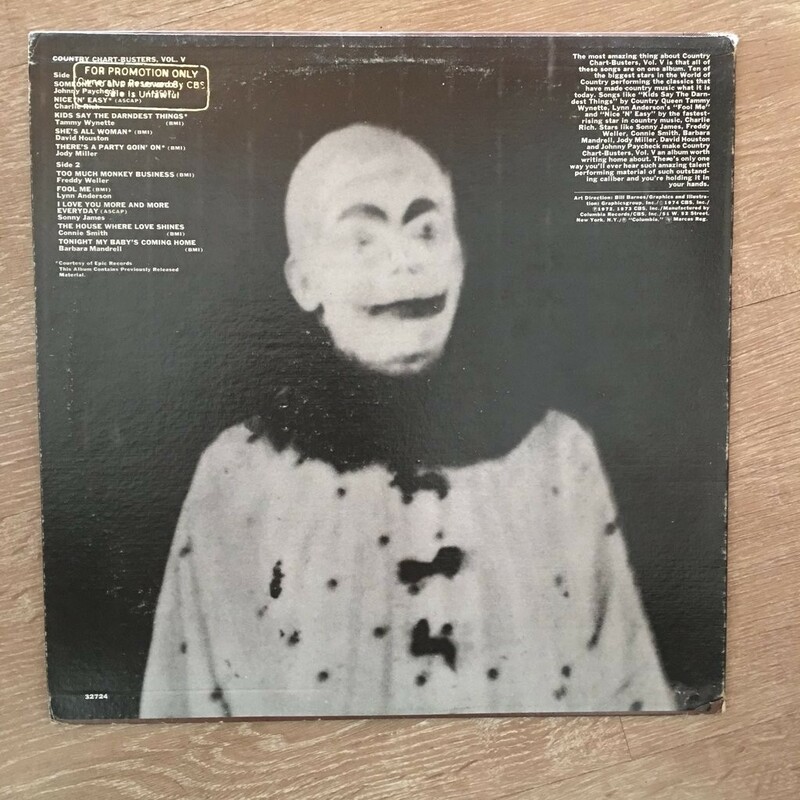 Why someone though it would be a good idea to include a grainy photo of some creepy-as-hell clown on a collection of country hits I have no idea. While the front cover is a jovial, old timey depiction of three country musicians somehow managing to ride a horse simultaneously while standing up and holding guitars, the back cover is pure nightmare fuel from way out of left field. Is he supposed to be a rodeo clown or is he some ghoul who will murder you in your sleep while the sounds of Johnny Paycheck and Barbara Mandrell play softly in the background? Or worse yet, is he Crazy Joe Davola? Anyways, read the liner notes below while trying to figure out who thought this was a good design idea and whether they got to keep their job after this was released. And then try to scrub this horrific image from your memory forever. The sweet sounds of Lynn Anderson may help in that regard. 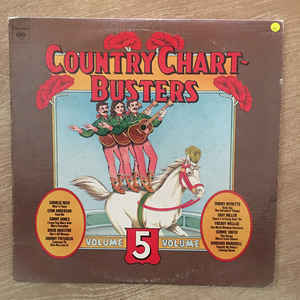 The most amazing thing about Country Chart-Busters, Vol. V is that all of these songs are on one album. ten of the biggest stars in the World of Country performing the classics that have made country music what it is today. Songs like “Kids Say The Darndest Things” by Country Queen Tammy Wynette, Lynn Anderson’s “Fool Me” and “Nice ‘N’ Easy” by the fastest rising star in country music, Charlie Rich. Stars like Sonny James, Freddy Weller, Connie Smith, Barbara Mandrell, Jody Miller, David Houston and Johnny Paycheck make Country Chart-Busters Vol. V an album worth writing home about. There’s only one way you’ll ever hear such amazing talent performing material of such outstanding caliber and you’re holding it in your hands.